Hello! This is Holly from Revamperate again, and I’m here to talk about tea. More importantly, matcha green tea! Ever had it? I had a matcha green tea latte at Starbucks once, and I wasn’t very convinced, but this time is different. Like any good Starbucks drink, I figured it would probably make a really good baked good (because that’s obviously how I think). 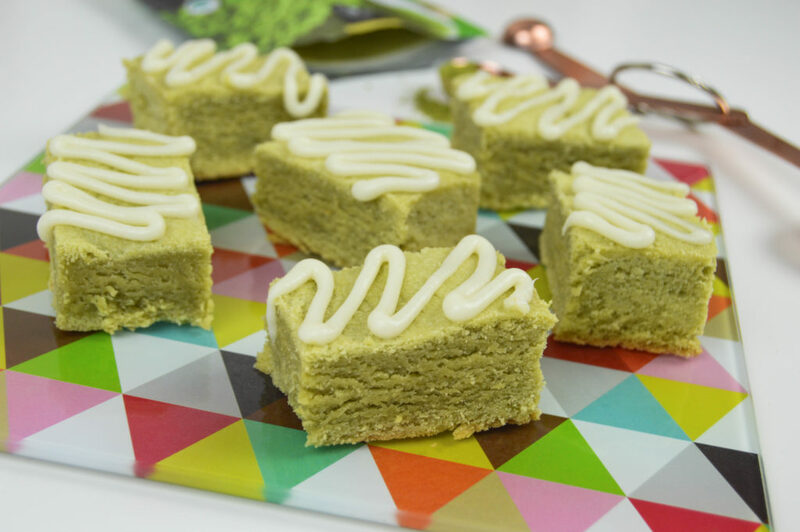 When paired with a sweet cream cheese frosting, these green tea latte cookie bars are magical and they will definitely make you think of something you’d see on the menu at Starbucks. I was pleasantly surprised because I didn’t think I would love the matcha flavor very much. I turned it into a shortbread-like bar made with just enough matcha powder to taste without it being too overwhelming. 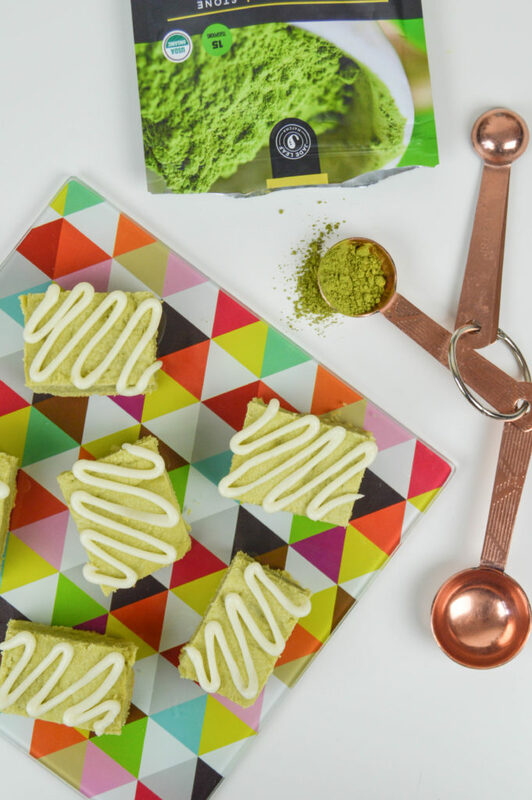 The flavor of the shortbread-like green tea latte bars combined with the sweetness of the cream cheese make very a well balanced cookie. And here’s how to make them! Preheat the oven to 350 degrees and line a 9×5 inch cake pan inch pan with parchment paper. I use a loaf pan because it makes about 10 good-sized bars, but you can double the recipe for a 9×9 pan and adjust the baking time. Lightly spray the parchment with cooking spray and set aside. In your mixer fitted with a paddle attachment, beat the butter until completely smooth. Add the powdered sugar and matcha green tea powder and mix well. Add the vanilla. Mix in the flour a little at a time until fully combined. At this point, the dough will be very crumbly. Scrape the bowl, add the egg yolks and mix until incorporated. Manipulate the dough with floured hands and then press into the lined baking pan, evening out the top with your hands to make it appear as smooth as possible. Bake for 20-25 minutes until the edges of the pan appear to brown to lightly. If you carefully touch the middle of the shortbread, it should not feel doughy. Let cool completely on a wire rack. Once cool, pull out of the pan by the parchment and cut into squares. To make the cream cheese drizzle, beat the cream cheese and butter with a paddle attachment until smooth, about 2 minutes. Add the powdered sugar a little at a time until completely combined. Mix in the vanilla extract and move the frosting into a piping bag fitted with a small round tip. 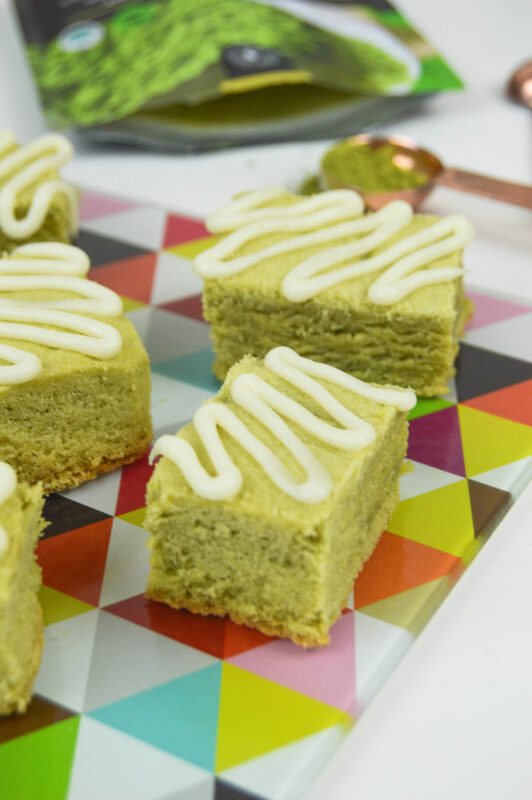 At a diagonal, pipe drizzles of cream cheese frosting over the cut green tea latte bars. If you prefer, you can spread the frosting over the top of the bars instead. Note, if possible, do not cover with frosting until ready to serve. Shortbread is best kept at room temperature and frosting is best kept in the refrigerator, so I recommend waiting to spread with frosting in order to keep them tasting as fresh as possible. Enjoy alongside an actual green tea latte and enjoy! P.S. Check out 15 Starbucks Recipes to Make at Home!